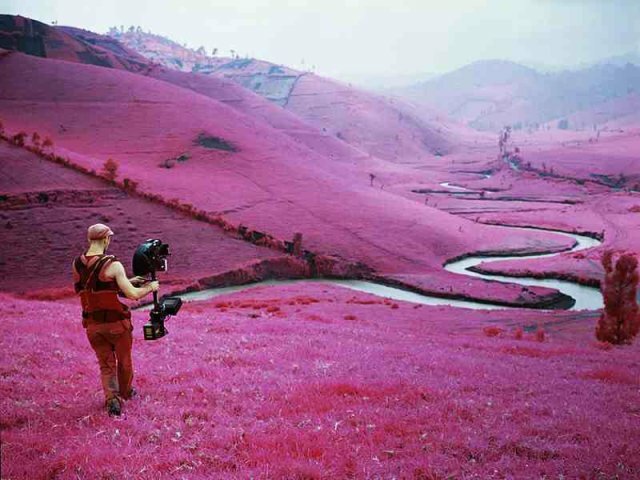 Richard Mosse - Deutsche Borse Photography Prize 2014, Nominee. The Photographers Gallery releases the list of Nominees. The Enclave, production still, Trevor Tweeten (cinematographer) shooting Arriflex 16mm camera mounted on Steadicam in South Masisi, Nov 2012. Since being established in 1996, each year the Prize has celebrated the best in photography, whether a publication or exhibition. It is one of the largest art prizes in the UK, proving a pivotal point in many photographers' careers. Past winners include Richard Billingham, Broomberg & Chanarin, Andreas Gursky, Boris Mikhailov and Juergen Teller. Now in its seventeenth year, the Deutsche Börse Photography Prize 2014 rewards a living photographer, of any nationality, for a specific body of work in an exhibition or publication format, which has significantly contributed to photography in Europe between 1 October 2012 and 30 September 2013. This year's finalists are Alberto Garcia-Alix, Jochen Lempert, Lorna Simpson and Richard Mosse. Brett Rogers, Director of The Photographers' Gallery, is the non-voting Chair. The winner of the £30,000 Prize will be announced on Monday 12 May 2014. "Each of this year's nominees proposes compelling new ways to expand our thinking about the medium. Image and text underpin Lorna Simpson's unique approach to interrogating gender and identity, whilst for Garcia-Alix the camera becomes an extension of his psyche - 'a way of seeing which is a way of being'. In drawing our attention to anthropomorphism, Jochen Lempert combines the precision of a scientist with the lyricism of a poet. For Richard Mosse, discontinued military surveillance film provides both the medium and themessage, transforming the horror and brutality of war into a surreal form of documentary." "This year's shortlist once again shows the vitality and broad variety of approaches to contemporary photography. We are impressed by the jury's excellent selection and very much look forward to the 2014 exhibition - especially as it marks our tenth anniversary as sponsor of Europe's most renowned photography prize." Richard Mosse (b.1980, Ireland) is nominated for his exhibition The Enclave at Venice Biennale, Irish Pavilion (1 June - 24 November 2013). Mosse documents a haunting landscape touched by appalling human tragedy in eastern Democratic Republic of Congo, where 5.4 million people have died of war related causes since 1998. Shot on discontinued military surveillance film, the resulting imagery registers an invisible spectrum of infrared light, and renders the jungle warzone in disorienting psychedelic hues. At the project's heart are the points of failure of documentary photography, and its inability to adequately communicate this complex and horrific cycle of violence.